Make a purchase at your nearest U.S. 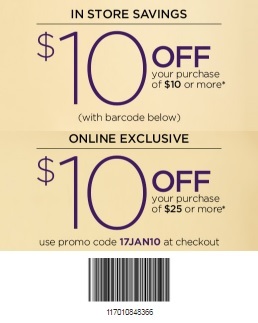 Motherhood Maternity store and take $10 off your purchase wheny you spend $10 or more! If you want to shop online you can also get a discounts. Take $10 off your purchase when you spend $25 or more. To receive the offer online use the promotion code 17JAN10 at checkout. To receive the offer in-store use the barcode. Source of the information is Motherhood Maternity. Offer ends TODAY (01/28/2017). More details available at your nearest U.S. Motherhood Maternity store location or Motherhood Maternity online.